On Oct. 23, the History Museum opens its doors to an exhibit that celebrates an epic achievement in the book arts. Illuminating the Word: The Saint John’s Bible features 44 pages from the first handwritten and illuminated Bible commissioned by a Benedictine monastery. Detail from Letter to the Seven Churches with the Heavenly Choir, Donald Jackson, 2011. The Saint John's Bible, Order of Saint Benedict, Collegeville, Minnesota. You can find out more about our exhibit here. But for now, we’d like to send out heartiest congratulations to Saint John’s Abbey and University in Collegeville, Minn., along with Donald Jackson and his team of scribes and calligraphers. On Thursday, the abbey announced that 15 years of transatlantic work had been completed, with the word “Amen” having been written on the final page of the seventh and final volume of the Bible, Letters and Revelation. 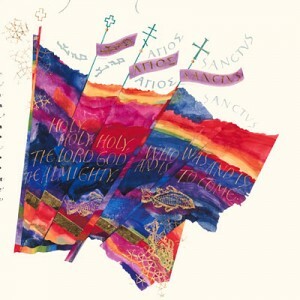 The Saint John’s Bible is a fifteen year collaboration of scripture scholars and theologians at Saint John’s Abbey and University in Collegeville, Minnesota with a team of artists and calligraphers at the scriptorium in Wales, United Kingdom under the direction of Donald Jackson, one of the world’s foremost calligraphers and Senior Scribe to Her Majesty Queen Elizabeth’s Crown Office at the House of Lords. Written and drawn entirely by hand using quills and paints hand-ground from precious minerals and stones such as lapis lazuli, malachite, silver, and 24-karat gold, The Saint John’s Bible celebrates the tradition of medieval manuscripts while embracing 21st century technology to facilitate the design process and collaboration between Saint John’s in Collegeville and the scriptorium in Wales. With his fellow scribes and illuminators at a to-die-for scriptorium in Wales, Jackson carried out the monks’ request for a monumental Bible. When opened, it will measure 2′ tall by 3′ wide, with its nearly 1,150 pages bound into seven volumes. Saint John’s Abbey and University are dedicated to ecumenism, and the text, translation and imagery in The Saint John’s Bible reflect this commitment. Theologians and scholars at Saint John’s University selected the New Revised Standard Version (NRSV) as the translation for The Saint John’s Bible. Though each letter is rendered by hand, The Saint John’s Bible uses state-of-the-art computer technology to create and manage page layouts as well as employing contemporary scripts and illumination. Illuminating the Word will share its exhibit space and spirit with Contemplative Landscape, which uses archival and contemporary black-and-white photography to reveal how people have responded to New Mexico’s art, architecture, land and sacred rituals. 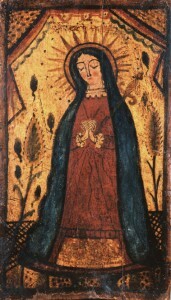 Earlier this year, History Museum Director Frances Levine and Josef Diaz, curator of Southwest and Mexican Colonial Art and History Collections, were in Mexico City, talking to officials at the Museo Franz Mayer about their museum possibly exhibiting some of the retablos and bultos from our Treasures of Devotion/Tesoros de Devoción exhibition. 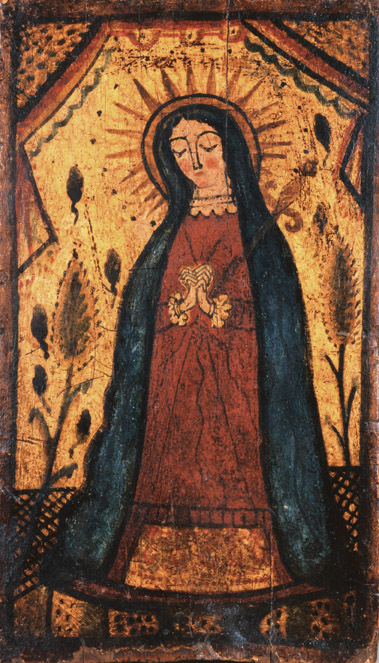 At one point, Director Héctor Rivero Borrell brought out a few retablos he had recently purchased for the Franz Mayer. At that moment, the seed of a future exhibition took root. In a grand partnership resembling the mash-up of three U.S. museums and a Spanish museum behind last year’s exhibition, The Threads of Memory: Spain and the United States, the History Museum is now partnering with the Franz Mayer, the Museum of Spanish Colonial Art in Santa Fe, and the San Antonio (Texas) Museum of Art for yet another bi-national exhibition. We recently received a $23,000 convening grant from the Terra Foundation for American Art in Chicago to lay the groundwork for a collaborative exhibition on the art of santos, one of the most definining art forms of this region. 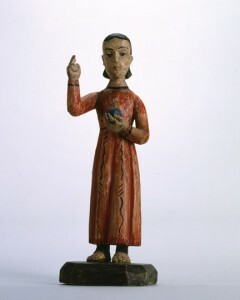 With the grant, the museums are looking at the larger picture of the art of santos and may revise historical interpretations of the tradition from the mid-18th century to the first quarter of the 20th century in New Mexico, using works from the New Mexico History Museum/Palace of the Governors, Museum of Spanish Colonial Art, other museums and private collections. The plan is to mount an exhibit that will illustrate how the art form developed as it moved beyond the academic center of Mexico City into the colonial “wilds” of northern New Spain. Were different native materials used? Did the long distance and relative isolation affect santeros’ artistic interpretations? By juxtaposing Mexican and New Mexican devotional pieces, organizers hope to emphasize their connections in terms of style and religious conviction. Anyone who’s visited Santa Fe during Spanish Market knows that this artistic tradition is still a vibrant part of the lives of Hispanic communities in New Mexico. To emphasize that, the exhibition will include a sampling of modern works. The exhibit is anticipated to run from 2015 through 2016. It will first travel to Mexico City, then San Antonio, and finally to the Palace of the Governors. In July, museum directors and scholars from Mexico, Texas, Colorado, and New Mexico gathered at the History Museum to begin their planning. Attendees brought their expertise on santos and Mexican religious craftsmanship. The group visited the Palace of the Governors, Museum of Spanish Colonial Art, and Museum of International Folk Art to begin assembling a collection for the exhibit. They also discussed conceptual material and a research plan to move the project forward. Next step? The group reconvenes in Mexico City in October. On April 4, 1818, Congress enacted the Flag Act of 1818, setting forth a rule that no new stars could be added to the flag until the Fourth of July immediately following a state’s admission to the Union. Thanks to that once-a-year-and-only-once-a-year mandate, New Mexicans hoping to share their pride at becoming the 47th state were essentially forced into committing their first illegal acts as U.S. citizens. And flag manufacturers, only too happy to supply the demand, made their day by stitching together 47-star flags in willful disobeyance of that 1818 law. In celebration of New Mexico’s centennial, the History Museum will commemorate that dip into the dark side with 47 Stars, an exhibit of the officially unofficial 47-star flag. (Actually three of them, shown in rotation to reduce the strains of being on display.) From January 6 through November 25, 2012, the flags will join a collection of long-term exhibits about statehood and a tongue-in-cheek front-window installation marking our entrance into the Union. 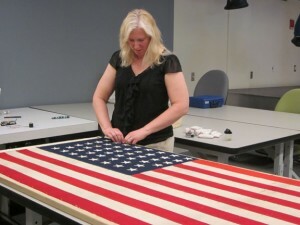 Here’s the news nugget: This week, Rebecca Tinkham Hewett, part of the crackerjack conservation team for the Museums of New Mexico, began prepping the smallest of the three flags for display. · Audio re-enactments of arguments for and against New Mexico’s entry into the Union, produced by aural historian Jack Loeffler. · A photo of the 1910 Constitutional Convention. · President Taft’s proclamation of statehood and the pen he used to sign it. · The top hat worn by William McDonald to his inauguration as New Mexico’s first governor. What makes the flags officially unofficial? Just 39 days after New Mexico became a state on January 6, 1912, Arizona stepped up to the statehood plate on February 14, 1912. By virtue of coming in second, Arizona would receive its just due on July 4, when the official flag of the United States was to switch from 46 to 48 stars. In the meantime, patriotic New Mexicans wanted a flag of their own , and eager U.S. flag manufacturers came up with the unofficial 47-star flag. How the three flags ended up in the museum’s hands involves a whole lot of out-of-state miles. The 34½-by-72¼” flag Tinkham Hewett is working on was delivered to the museum in 2001 by a Mrs. James Hetzler, office manager of a church in St. Louis. While cleaning out a closet, she found the flag and figured it was left by a since-disbanded Boy Scout troop. 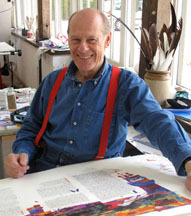 The medium-sized, 43½-by-93½” flag was donated by a Fredrich Liberet in 1988, who said it had been passed down by his great-great-grandfather. And the largest, 65-by-115¾” flag arrived in 2000 from a woman who said it had belonged to her father in Drexel City, Penn. 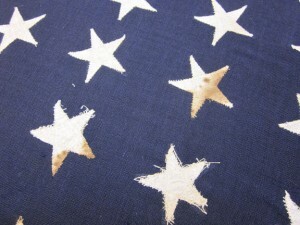 Made of a plain-weave wool, the small flag is missing a few stars on the side visitors won’t see. On the side they will, a few of the stars show slight stains. Tinkham Hewett isn’t certain what made the stains, but said she won’t take pains to remove them. Come Jan. 6, Tinkham Hewett’s careful work will come to fruition, helping the museum bring the centennial to life.